Okay, I am definitely not like the other teachers..... I love teaching Social Studies! I guess maybe it is my upbringing. My dad taught junior high Social Studies and published several local history books. Most students don't find it engaging though. Challenge accepted! 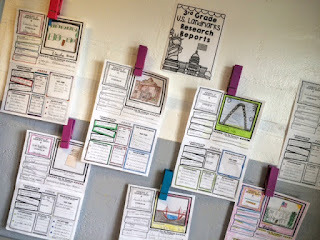 Here are my best tips on how to get your students excited about Social Studies (with a bit of help from some teachers in the All About 3rd Grade Facebook Group). 1. Use technology for research. Looking at your state standards for teaching can be a bit scary, especially when the word RESEARCH is involved, but I have found with the right tools, it can actually be fun and very rewarding. Start with a broad topic like monuments and landmarks and give the students a wide variety of topics. Give them a graphic organizer to collect their information with and try out some of these great places for research! Kiddle.co is a "safe visual search engine for kids" where you won't have to sweat about what might pop up in the search results. I use it in my classroom as well as teacher Erika D. who loves it because there are "no accidental inappropriate results." Amen Erika! We have all been there. Enchantedlearning.com also has some great information that is kid friendly. We have used it on several occasions with great results in my classroom. On the right side their is a search box where the students can type in any subject (Gateway Arch for example) and there will most likely be some information that is written on the topic in more kid friendly terms. DKFindOut.com is a site I just learned about from Jackie S. and I am so excited about it. Jackie said, "We just used it to learn about the seven continents." The site is built for kids and it very visual. They have 43 history topics, several map topics and even topics on world landmarks. I fell in love with this site because it looks so easy to navigate for young students. Give your students graphic organizers for their social studies research that can double as posters for display. It really helps them research on a more independent level because they have parameters to search for that are more specific. So what social studies research topics could you try? Here are some popular ideas: continents, historical dates, monuments and landmarks, U.S. regions, biography, presidents, states, and countries. Think of what you can ask to get donated from parents and businesses. It is so funny how the simplest addition to your social studies unit can add such an element of fun! When my class starts our mapping unit, I have a lot of fun making it a pirate theme. It really doesn't take much to just add a touch here and there. The easiest idea (and FREE) is to ask Long John Silvers to donate pirate hats from their restaurant. I also put a note out to my parents ahead of time asking them if one of them would mind picking them up. I have a volunteer every year. I also purchase some chocolate covered coins from the store (or ask them to donate). They are easily found during holiday candy sales time. Ask the kids to wear bandannas for the day for extra fun without a lot of fuss. Economics Unit - Cassie S. says she uses the following activities to teach economics from November through December. "We create classroom businesses and manufacture goods (ornaments, cards, glitter pine cones, etc.). I pay the students each day using beans based on how hard they worked/behavior. When the unit is over I charge the students tax. On the last day they shop at all the different businesses and get gifts for their families. Some things I cover are producers vs consumers, goods vs services, taxes, and supply and demand." I love this idea! Pine cones can be found for free and beans are super cheap. See what you can get parents to donate for you or pick up if you can get it donated over the phone. Pizza Boxes - If you are going to make any sort of displays (think biography units, historical event, etc), ask your local pizza place if they can donate a empty pizza box for each student to make a display with. They are great because they fold up and aren't so huge for them to take home on the bus. T-Chart - Make a oversize T-chart with the tape on the floor and have the students sort index cards. For example, they could sort cards that are names of goods or services. If you are studying the 3 branches of government, make 3 columns and sort words on index cards. Title the three columns (judicial, legislative, and executive) and then add definition cards and word cards (President, Congress, Supreme Court, makes laws, carries out laws, evaluates laws, etc.) that they can sort under those columns. Venn Diagram - Make a huge Venn Diagram on the floor and have them sort cards also. Maybe you might be studying the Plymouth Colony and Wampanoag Tribe. You could compare and contrast these two groups with index cards. National Geographic Kids has a great video and informational article written for kids on this subject. Grid Maps and Latitude and Longitude - Instead of just learning our map skills on paper, I also have my students get active by making grids and lines of latitude and longitude on the floor. Anna C. said, "We are going to attempt to turn our next unit into a play because it is character-heavy." If you are studying about historical figures, this would be such an amazing incorporation of technology, language arts and social studies. If you are studying the Presidents, Women's History Month or Black History Month, you could have small group choose a figure to research and make a short video. 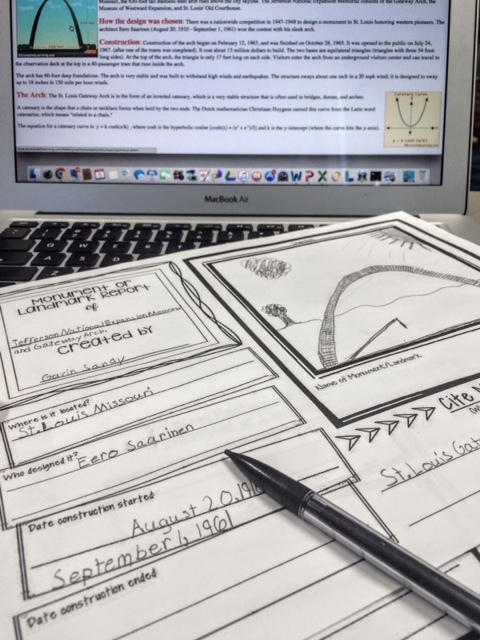 Angie C. says at the, "beginning of our explorer unit, the students use iPads to record reenactments of various history studies." 5. Have student's share their thoughts with technology. We have all seen the pictures of student's writing their ideas, questions or opinions on post-it notes and then put them all on a poster. Teachers can use this for informal assessment, how to drive their instruction, who got the concept and who didn't, etc. But post-it notes can get expensive. Here are two online "parking lot" sites for students to share. Padlet.com - I learned about this amazing sharing site from Iris R. Padlet "works like an online sheet of paper where people can put any content (e.g. images, videos, documents, text) anywhere on the page, together with anyone, from any device." (from the Padlet website) Iris described it as a , "virtual notebook where we can record our ideas all together and share. They can all type on the same page." Check out how her students shared on Padlet to the prompt "Which amendment in the Bill of Rights is most important to you and why?" This is such a great application of the ideas they have just learned in class. Todaysmeet.com - This online site is very similar to the above, but it is specifically made for teachers to use in their classrooms. Sara K. says, "It's a live feed website where students can type in responses and the whole class can see in real time. I use it for activating prior knowledge, small group talk, and formative assessment!" Nearpod.com - Heather B. says, "I like to create Nearpod lessons about the topic that I'm teaching. It's hands-on too in the respect that the students can draw to answer or write to explain." BrainPop.com and BrainPopJr.com - Wendy G. reminded me about this amazing resource that I use in my classroom (but had forgotten to mention). There are lot of amazing videos on this site to introduce or review social studies topics. It is a paid membership, however, they do have several for free! I do use them and my students love it! Here are BrainPop's Social Studies topics. GetKahoot.com - This idea comes from Erika D. and this site is such an easy to use site for teachers. I haven't used it much yet, but plan to much more! The Kahoot website says, "Kahoots are best played in a group setting, like a classroom. Players answer on their own devices, while games are displayed on a shared screen to unit the lesson - creating a 'campfire moment' - encouraging players to look up." Teachers can make review games and easily add images. It is SO user friendly. There are also already lots of pre-made Kahoots in the Social Studies category made by other teachers that are sharing for free! TimeForKids.com - Special shout-out to Joan W. who mentioned this site as a wonderful resource for Social Studies teachers. Joan has been in our All About 3rd Grade Facebook group from the beginning and has been so wonderful to be supportive so many teachers in our group! Thank you to all our group members who shared their ideas for making Social Studies fun and interactive. If you are interested in some pre-made Social Studies activities to make your planning a breeze, check out these Social Studies activities on Teachers Pay Teachers.